No video again this month, sorry. Where does the time go? 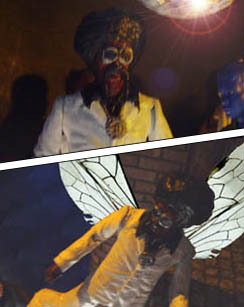 Apart from the obvious Doctor, Amy, Davros and all the various daleks this story features Space Daddy a 70s disco insectoid alien that appeared in the 2008 Torchwood episode Fox Hunt where he runs a disco for aliens in Cardiff. The role would have suited Dorium Maldovar had a figure of him been available. The Dalek in the cubby hole is meant to be the strategist but I got the colours mixed up and put the orange scientist in there instead. Episode One was posted on 19 September 2011 with episode two following on 23rd October. 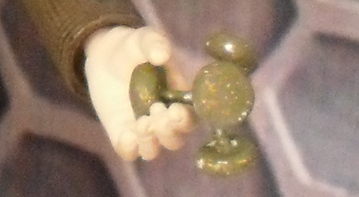 The whole story was inspired by the release of the little Amelia Pond figure which I wanted to use somehow in my stories. One of the first images that popped into my head was the scene where Amy takes a wrong turn and ends up in the cubbyhole with the Dalek and suddenly she’s too short to open the door again. That was the springboard for the entire arc. 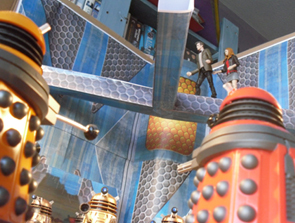 As with so many people, I wasn't a fan of the new Daleks and their cynical 'buy them all' colour scheme. But having got used to them (not to mention being able to buy them without having to fork out exclusive box sets to get them all) I've come to embrace them as the embodiment of the Matt Smith era Daleks and wanted to give them a proper story, rather than the introduction and subsequent cameos they've had on TV. Having said that, I thought it would be a nice idea to have Davros and his Daleks come in to whip their over inflated backsides. A view obviously shared by the creators of the Doctor Who Experience. Apart from Amy Alone, which was shot last year, this was the first story to be filmed for this arc kicking off on 19th May 2011 with the main giant Dalek set with the gantry above. I find it’s always best to do the biggest and most complex scenes first, then it gets easier as you go along. Also on the 19th, I redressed the set with a few bits and pieces strewn about to make the derelict ship. It was redressed again for the 20th May to do all the corridor scenes and again on the 22nd/23rd to do the scientist’s cubby hole, the Eternal’s office and the mind drain scenes. 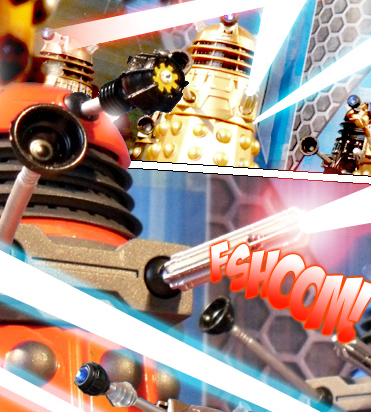 The sets were all based on designs from City of the Daleks- and are available on AFTDownloads. Also on the 23rd, I filmed the scenes on Davros’ ship using the design from the Russel T Davies era- also available on AFT Downloads. 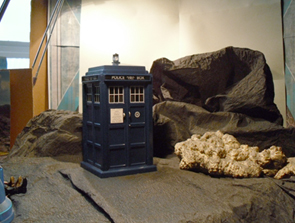 It was a month later that I did the Skaro exterior scenes. They are basically crepe paper landscape against a blue background onto which I could put the Dalek’s burning city. It wasn’t until 18th September that I shot the small scene in Space Daddy’s shop. As always, some of the dialogue was tweaked while editing, especially some of the lines relating to Amy’s condition as it wasn’t really properly explained what was going on. I also pulled a few lines from Space Daddy that referred to a story that was going to be made but hasn’t yet. Hawk eyed readers might notice that the Doctor uses the dematerialisation circuit (see a lot in the Pertwee era) to make his transmat. Although the eleventh Doctor's adventures continue next month, this concludes the Big Amy/ Little Amy arc that began with Amy Alone. 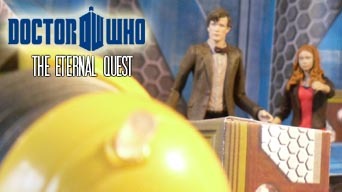 I have speculated about the role of the Dalek Eternal. I daresay the production team will come up with something more imaginative in due course. River Song fans, I'm afraid you'll have to wait a little longer. 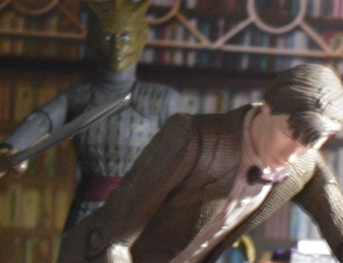 This story was intended to lead directly into her return but a quick poll on ODW decided that Vastra would be seen next time.